Costa Rica is becoming an increasingly popular tourism destination and vacationers who want to return to this gorgeous place time and again will want to buy Costa Rica timeshare property. With Luxury Leisure Alliance, you’ll have access to the luxurious Cocoa Bay Estates - the perfect place to own a piece of paradise. Cocoa Bay Estates is ideally located along the country's Gold Coast on the Pacific side of the country. Situated within easy distance of the town of Playas del Coco and scenic Playa Ocotal beach, a stay at this property is filled with fun and entertainment. Guests are free to be active or to relax the days away while lying on the sandy beaches. The choice is truly yours when you buy a Luxury Leisure Alliance membership and have access to the numerous accommodation options at this property. Costa Rica is known for having an advantageous climate, and people who vacation here get to enjoy golf, water sports and unique cultural experiences under sun-drenched skies. It's the perfect setting for indulging in a getaway that rejuvenates both mind and body. At this luxurious property guests savor lush landscaping that makes the resort genuinely reflect its tropical surroundings. This master planned community has been designed with extraordinary care to ensure that there is a multitude of quiet, private corners throughout the property. There are also many wonderful places for groups to gather such as at the pool or the open air grill. With a charming location and a wealth of property amenities most people are already enticed to buy Costa Rica timeshare through Luxury Leisure Alliance. However, the condos themselves are also inducements. They are spacious and well planned with carefully coordinated interior décor that reflects the tropical setting. You'll enjoy a soothing and relaxing stay at these two and three bedroom units. Most condos have fabulous kitchens with all the amenities required for whipping up a gourmet meal. Enjoy the gorgeous view from the terrace while the sun sets over the ocean. People who choose Cocoa Bay Estates through Luxury Leisure Alliance get access to the exclusive Tennis Club and Fitness Center. These amenities have everything that's necessary to help guests get or keep in shape during their stay. The Tennis Club features four hard surface courts and a pro shop to see to all of your equipment needs. At the Fitness Center guests enjoy state-of-the-art cardio and weight training machines in addition to group classes that include yoga, Pilates and various cardio disciplines. Luxury Leisure Alliance members also have access to the Coco Bay Beach Club. 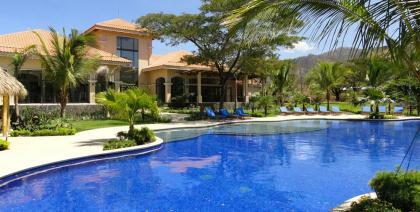 This desirable benefit grants access to a private stretch of Costa Rica's most beautiful shoreline. Within the club guests can visit the Ocotal Beach Club with its restaurant and bar. An additional pool is located within the club, and it's always easy to arrange for poolside service. You will find everything you need just by asking. Staff members can help locate chairs and towels as well as arrange for fishing or boating expeditions. Equipment rentals are also available if you'd like to snorkel, ride a jet ski or paddle a sea kayak. With a timeshare at this resort, every vacation is a fantastic escape to paradise. Contact Luxury Leisure Alliance Specialist Today!